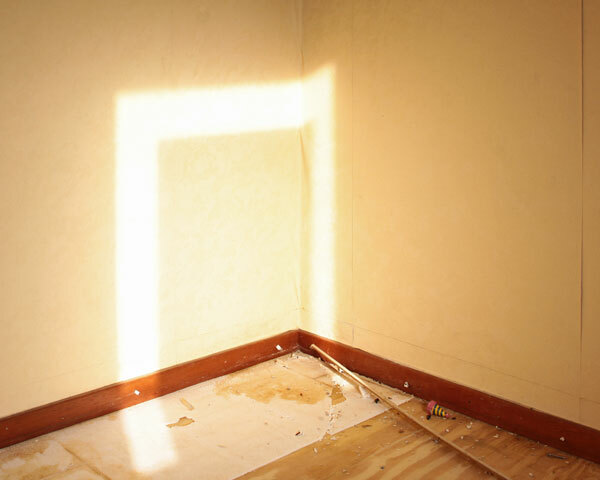 During Lorenzo's stay in Duende in Rotterdam he filmed in empty houses in Crooswijk during their demolition. The images are statements about time and movement in both esthetic (Italian?) as well as in social, political and philosofical way. Urban obsolesce and destruction play a central role in the work of the young Italian artist Lorenzo Casali. In his latest project, Permanence, presented in Rotterdam earlier this year, at the Duende Studios, Casali focused on the demolition of the neighbourhood of Crooswijk. In 2004 the city council of Rotterdam decided to replace most of the social houses of Crooswijk with new luxurious apartment complexes. The urban plan for the re-launching of the neighbourhood meant that more than ninety percent of the habitat would be torn down. In its place would rise new spacious apartment blocks. As most of the inhabitants could not afford to buy the newly constructed apartments and were forced to move away, this decision proved to be not only unpopular but also problematic. Many associations tried to stop or alter it, however they were not successful. In Permanence Casali films the last moments of life of the social houses. He concentrates in their almost empty interiors. As the images are shot minutes before the actual demolition the viewer is confronted with the increasing noise of approaching machineries. The noise is juxtaposed to the images of the interiors where, except the play of light and shadows, nothing seems to happen. Apparently there is no movement in the film, only a succession of images, as if they were photographs. We said “as if” because the camera approaches the spaces with a forensic clarity: walls which colours are still vivid, a forgotten book, a written name, a scraped paper, all become the digital evidence of the life they once contained. Time fills that natural emptiness, lights and shadows reset and recover a world in which everything is condemned to disappearance, demolition, and annihilation but Time. Time as continuity. Duration that struggles with single moments. We can find it in a slowly opening door which introduces space to the viewer. We’re looking at it in broken pipes that are pouring water from ceiling to the floor. Time is the rhythm of those drops. As a whole neighbourhood is about to vanish, the viewer can’t oppose himself but be captured by geometry of narrated spaces. While making the memories of the interiors extensible to future generations, Permanence is reflecting on what is about to vanish forever. Casali is treating the social theme as source for theoretical approach to Reality and time reveals itself as a-priori principle of knowledge. Permanence explores the stilleben and anti-monumental atmosphere of the memories of buildings. Already in an earlier work, Nyar Utca (2003) he addressed a similar problem, this time in Budapest, where houses from the former Jewish ghetto were razed to the ground, in order to make space for new constructions. In this work, Casali films the actual demolition process, from the exterior of the building. Two screens show the same event from different points of view, both filmed in super-8 mm, one in colour and the other in black and white (double parallel screen). In this stereoscopic illusion we find traces of documentary films of besieged cities, but also echoes of videogames such as Arcanoid, in which the aim is to destroy a wall of bricks that bounces on the electronic screen. Again, as in Permanence a certain emotional contemplation of destruction is paired with the actual social theme of the strategic urban transformation of a city area. In this sense, these two works, although site specific, point to a more universal state of affairs. The destruction of a familiar context, both in Rotterdam and in Budapest, is also a metaphor about the sense of loss that invades our world. Once the buildings are wrecked the memories of these places become difficult to articulate. Rather they survive only as a mental image, made of shadows and dreams. Their memory persists as a luminous trace of the retina, a last light remaining in our blind look before falling in the emptiness of the night. - Massimo Arioli, Urban transformations, Simulacrum #16/3, Amsterdam 2008.